The Facebook stock price has seen a big rally so far this year. Shares of Facebook Inc. (Nasdaq: FB) are up 12.45% in 2016, beating the S&P 500 by 8.9%. But Money Morning Director of Tech & Venture Capital Michael A. Robinson doesn't see the gains stopping there. In fact, there are two reasons why he sees the FB stock price rocketing 112% over the next four years. 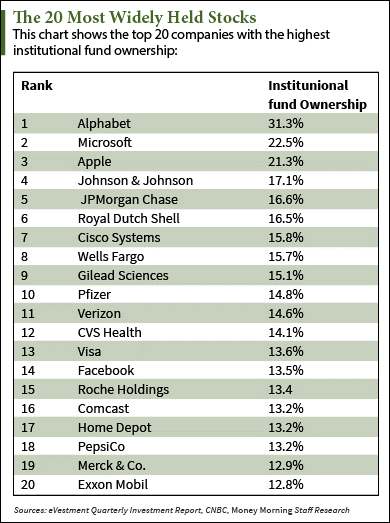 For the first time, Facebook now sits among the top 15 most widely held stocks among institutional investors like hedge funds and commercial banks. According to database research firm eVestment, the leading tech stock lands at No. 14 on the updated list. That means more "smart money" investors hold Facebook stock in their sizable portfolios than older, big-brand firms like Home Depot Inc. (NYSE: HD), PepsiCo Inc. (NYSE: PEP), and Exxon Mobil Corp. (NYSE: XOM). Facebook stock's slow ascension on the list shows how its performance is drawing more smart money investors, including the most skeptical ones. Back in 2014, Facebook was No. 35 on eVestment's list and has soared a staggering 399% since then. The stock jumped to the No. 23 spot by September 2015 and is up about 30% from that month. Since December, when Facebook stock was No. 16, shares have gained 12.7%. It's clear the social media giant is attracting more institutional interest as it continues to grow its top and bottom lines. During the first quarter, Facebook earned $0.77 per share on revenue of $5.4 billion, which was 10% higher than the highest Wall Street estimate. Its EPS and revenue grew 83% and 53% from Q1 2015, respectively. Despite its strong revenue growth since going public in 2012, Facebook is still a young company with plenty of room to run. The first catalyst of our Facebook stock prediction is the growing popularity of its two subsidiaries – Instagram and WhatsApp. While they haven't been monetized yet, Instagram and WhatsApp rank among the world's most popular social media platforms. Instagram has 400 million users, and WhatsApp boasts a whopping 1 billion users. Earlier this year, Facebook CEO Mark Zuckerberg mentioned plans to turn the two platforms into revenue streams. The company will start to build out business applications for WhatsApp and Facebook's other messaging platform, Messenger. These business apps will bring in money by charging fees in some markets. Meanwhile, Instagram will generate cash through advertising. According to research site eMarketer, about 10% of Facebook's global ad revenue will come from Instagram by 2017. Another exciting catalyst for the Facebook stock price is the company's foray into the $150 billion virtual reality arena. Two years ago, Facebook purchased Oculus VR for $2 billion to help it venture into the virtual reality market. Statista reports sales of the new Oculus Rift device, which was released in March, are expected to reach 3.6 million units this year. At an average price of $599 each, those sales will come out to a total of $2.2 billion. Although it's currently associated with video games, virtual reality will have far-reaching applications. Facebook aims to connect teachers and students across the world, provide basketball fans with courtside seats, and create face-to-face meetings between patients and doctors from home. That's one reason why analysts have raised their EPS estimates for Q2 and Q3 in recent months. Facebook is expected to earn $0.81 per share in Q2, up from prior estimates of $0.72. For the third quarter, analysts now forecast $0.87 per share, up from the previous $0.78 estimate. According to data from The Wall Street Journal, 40 of the 48 analysts covering FB stock give it a "Buy" rating. The median 12-month price target is $145, with a high of $170. But our Director of Tech & Venture Capital Michael A. Robinson believes Facebook stock is worth much more than that over the long term. By 2020, Robinson sees FB shares changing hands at $250 a share. That represents a rise of 112% from yesterday's closing price of $117.76. Follow us on Twitter @moneymorning and like us on Facebook for more updates on the Facebook stock price in 2016.